This past Saturday I took my mom to Crystal Springs Rhododendron Garden as an early Mother's Day outing. It was overcast out and a bit chilly once we got down into the gardens. 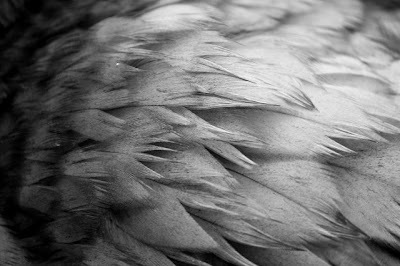 I was a bit more experimental than I normally am with the photos here - especially when it came to the ducks. I popped on my zoom and got some detailed photos of their feathers (they were pretty tame ducks and they let me get very close). Once I got the photos home, I played around with contrast, shadows, brightness, and vibrancy with the RAW images in Photoshop's RAW plugin. This is one of two black and whites I created. I really like how it turned out showing the details of the feathers. I think this was a close up shot of a wing.